For any property you don’t want exposed, make the Getter: Internal & Setter: Public. 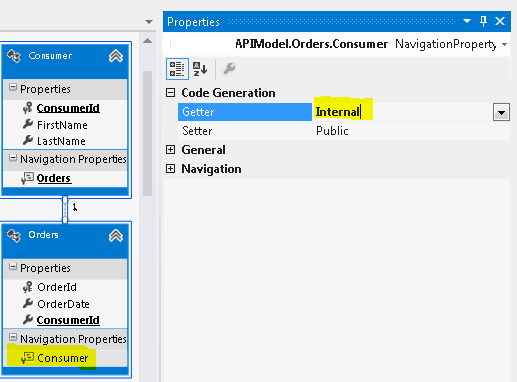 Doing this on standard (field) properties will prevent those fields from being serialized & exposed (for example, in the ASP.NET Web Api). This means there is no need to add Newtonsoft.Json.PreserveReferencesHandling settings to your Global.asax Application_Start which results in REALLY ANNOYING $ref & $id properties being added to your serialized results). 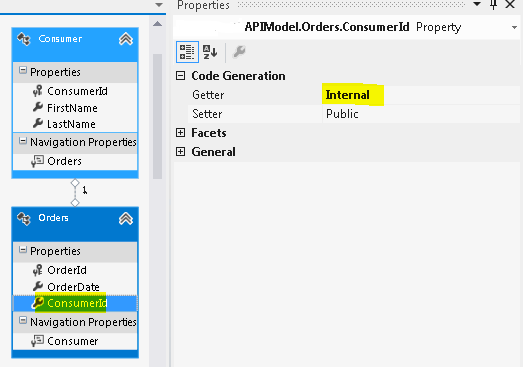 Note: This is still a GREAT way to add things like data validation attributes to properties generated using db-first EF. They’re just not necessary to prevent the circular ref exception. I hope this helps save someone some of the time I spent this week attempting to work around it. Big thanks to @DavidBitton for the ongoing Twitter dialog that led to this easier-to-implement-than-other-findings solution. I know this is an old post and maybe the author won’t see this, but….this just bit me… you saved me ooodles of time. Thanks, The only solution that worked for Database First. Awesome. Thanx so much. Struggling with this for two days. That being said, Rui is right this is the only solution that worked for database first. just spent 2 days now and have had this problem before too, could never think of this solution. Thank! So thankful to the author! Having been struggled for this for days. Use F12 to find the exact error, and bing it, that brought to me to this site! Yay! Took a lot of searching to find this article, but it helped me. Thanks!